Roma Street Parkland sits on 16 hectares in the centre of the Brisbane CBD and a veritable oasis in the middle of the city. The parklands are adjacent to the Brisbane Transit Centre and Roma Street Station and are considered to be the world’s largest subtropical garden in a city centre. The parklands are home to grassy picnic spots, subtropical plant displays, colourful flower displays, fern groves, rocky peninsulas, barbeque areas and playgrounds for kids.There's something for people of all ages with a visual feast everywhere you look. Roma Street Parkland offers a wide variety of free guided walks through the gardens led by experienced volunteer guides. There’s a walk for everyone as they all vary in length and time. The walks depart daily from The Hub and begin at 10am and 2pm. They last for about an hour as you walk past the display sin the Spectacle Garden, Misty Fern Gully, by the lake and past the Pandanus Headland. There are special walks for children under 5 and their carers which are stroller friendly. They depart at the Melange every Wednesday and Friday at 10am and run for 45 minutes. There’s also a whole host of specialised walks so you can learn a different aspect of Parkland and its history. 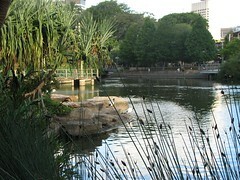 One major drawcard is the art works displayed in The Roma Street Parklands. When the site was first developed, 16 Queensland artists were commissioned to create a collection of 15 pieces of works for the parkland. They each tell a story in a different medium including sculptures, mosaic, paving, bronzes and murals.There’s a self guided walk which you can take to lead you past all the different works. There’s lots of lovely grass to sit on and enjoy a picnic or you can choose a picnic table and have a barbeque. Located inside the parklands is the laidback Melange Cafe where you can have a long lunch, a quick sandwich or grab yourself an ice cream. The Melange is located on the ground floor of the Carriage Shed. It’s a very popular and beautiful place to say your wedding vows. Roma Street Parkland is also home to a large open air amphitheatre. Each year a variety of plays are held in the amphitheatre by different Queensland playgroups. It's very popular to watch Shakespearean plays performed here in the park.